A comfortable multi-use stack chair! The fabric padded seat and back offer extra comfort, and the chrome plated steel frame make this chair sturdy enough for any event. Features include a durable plastic seat & back shell, stable sled base, built-in ganging brackets (links chairs into rows), teflon-coated, stain-resistant fabric rated at 750,000 double-rubs to help keep the chair looking new longer, 250 lbs. weight capacity, stacks 16 high on optional 310-dolly (8 without dolly) for easy space saving storage. These chairs meet or exceed ANSI/BIFMA standards. Dimensions: Seat size: 18.5"W x 17.5"D. Back size: 17"W x 14.5"H. Seat height: 18.5". Overall height: 33". Limited lifetime warranty from OFM. 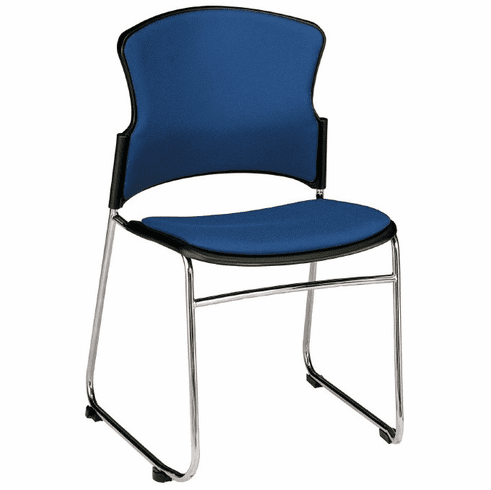 These multi-use stacking chairs normally ship within 1-2 business days from our NC or AZ warehouse. *Ships by tractor trailer due to the size. Customer will need to unload the chair from the tailgate of the truck. Inside delivery is available as an option.